Scramble was awesome! Well, it was when you consider it was released in the wild way back in 1981. Not much like it had been seen before, and it was super-addictive if not hard and intense. 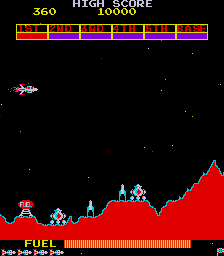 So many things for the player to keep their eyes on; baddies, bombing, laser blasting, avoiding and navigating sometimes an almost impossibly difficult landscape! A bonafide classic for sure!